If you're lucky, it's time to get your Final Fantasy on, next-gen MMORPG style. Square Enix has opened up beta applications for its upcoming PC and PS3 MMORPG Final Fantasy XIV. This will be the first chance for gamers to experience the new gameplay systems Square Enix is said to be implementing in the game that differ from typical MMORPG conventions. Applying is easy. First, visit the FFXIV beta portal and choose your region. All are welcome, with beta application pages available in Japanese, English, French, and German. Then, make sure you have a Square Enix ID (if not go here first) and fill out the information required on the application page. I just found it a little strange that Square Enix forces you to say you run a fansite of some kind in the very last question. The beta is currently only taking place for the Windows version of the game, with details for the PlayStation 3 version coming along later. 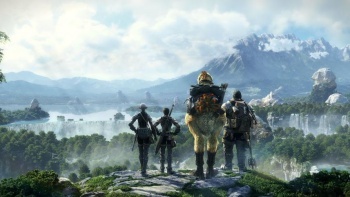 In a recent interview with Develop, Square Enix president Yoichi Wada said World of Warcraft is very tough competition, but he believes Final Fantasy XIV will be a serious rival. This is in part due to whatever Blizzard's next MMOG will be, as Wada points out that it is unlikely for a company to have the number one and number two MMOGs at the same time, giving FFXIV a chance to steal some thunder. It could happen, I suppose, especially if Square Enix implements everything it says it will into FFXIV, including a focus on viable solo play. Those lucky enough to get into the beta will be able to see if Wada is full of hot air, or if he has some substance behind his predictions.